The Star Lake Property Owners' Association (SLPOA) is committed to providing communication to its members about important topics impacting our lake. We will update this page with information regarding the Shooting Star Casino project as it becomes available. 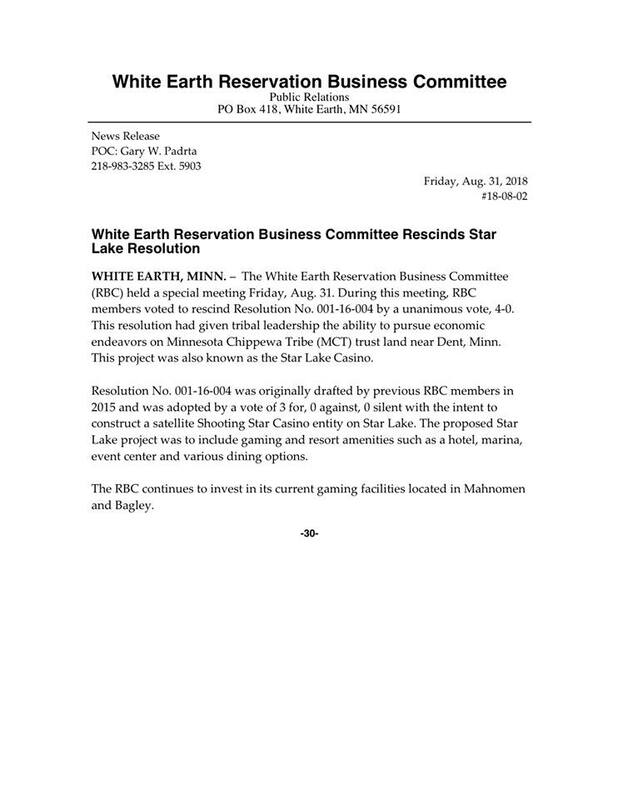 08/31/2018 White Earth Reservation Business Committee rescinds Star Lake Resolution (see copy of News Release). This means that the casino project has ended. The OTC Board of Commissioners public comment period on the EAW (Environmental Assessment Worksheet) for the Star Lake Casino Development project ended on June 21, 2017. Thank you to those of you who took the time to submit comment. Watch our website for updates and next steps. The OTC Board of Commissioners will review the comments received. Discussion/decision is scheduled for the July 11, 2017 Board of Commissioners meeting (1 pm); Govt Services Center in Fergus Falls. The Army Corps of Engineers public comment period on the Federal permits filed by the White Earth Nation ended on November 28, 2016. Thank you to those of you who took the time to submit comment. Watch our website for updates and next steps. The comment period ended November 28, 2016. The Star Lake Property Owners Association Board and its membership have grown frustrated and impatient with the environmental process and lack of concern for the property owners of Star Lake and surrounding communities by the Ottertail County Commissioners and the White Earth Nation. The Ottertail County Commissioners appear to be overlooking and disregarding the environmental consequences of the largest commercial development in Ottertail County's Shoreland District. The Ottertail County officials and White Earth Nation have taken advantage of and hidden behind the Trust Land and Fee Land jurisdictional laws and regulations. There needs to be a full and collective environmental review on this development. Ottertail County has an obligation to follow its ordinance and understand that this development does not fit within its parameters of compatibility and suitability for the Star Lake Area and the sensitive shoreline it is proposed on. We feel that the information provided by the White Earth Nation at this point regarding the environmental, social, and economic impacts has been insufficient for the Ottertail County Commissioners to make any informed decisions. The White Earth Nation has a responsibility to avoid all environmental impacts just as any other development on the shores of Star Lake would be required to do. We are calling on the Ottertail County Commissioners to take action and require the White Earth Nation to complete an Environmental Impact Statement. This will allow for full transparency to the potentially irreversible impacts to Star Lake. The Star Lake Property Owners Association has joined the Star Lake Concerned Citizens Group in expressing the same concerns for Star Lake and will ensure that the White Earth Nation and Ottertail County avoids and eliminates all environmental impacts to Star Lake. The Star Lake Property Owners Association is asking the Otter Tail County Commissioners to fulfill their responsibility and obligation to protect Star Lake and the surrounding communities. OTC, in collaboration with the White Earth Nation and SRF Consulting Group, held an Open House style meeting on June 9, 2016 at the Dent Community Center. An Open House style meeting is an informal meeting with information on display for review by the public and interested persons. See the OTC website to view the presentation materials as well as access a link to provide feedback. This is to advise that Otter Tail County and the White Earth Nation has mailed a notice this week of a “Neighborhood Meeting” regarding the proposed development of the Shooting Star Resort and Casino. The meeting will be held at the Dent Community Center on March 30th from 6:30 to 8:30 P.M. The notice was sent to property owners/residents that live/own property in the immediate area of proposed development. The intent of the meeting is to provide basic information regarding the planned development, and to gather input from the neighborhood residents regarding their concerns and questions. An “Open House” meeting for the broader Star Lake community is planned for a later date at a location to be determined. We will alert you to those details as they become known. Perham Focus article "Overflow Crowd fills Dent Community Center" posted April 1, 2016 - Click to view article. Maine Township session to outline nine mile installation near Dead, Star and Maplewood Park. Electrical infrastructure that will power the proposed White Earth Nation casino, in the heart of Otter Tail County, will be the focus of an informational meeting Feb. 23. Great River Energy and Lake Region Electric Cooperative will host a public information open house Feb. 23 at the Maine Township Hall, 32 300 Old County Highway 74, Maine, Minn. 56586 to share information about a 8.75-mile, 41.6-kV transmission line being proposed in the area. The public and other interested parties are encouraged to stop by the open house anytime between 4 p.m. and 7 p.m. to learn about the project. Great River Energy and Lake Region Electric Cooperative staff will be on hand to describe the project, answer questions and hear feedback on the project. The proposed project will serve the anticipated electric load of the proposed White Earth Nation casino facility and ensure continued transmission system reliability in the area. “We want landowners to be informed about the project and have an opportunity to ask questions and share their feedback,” said Great River Energy’s Transmission Permitting Analyst Marsha Parlow. Great River Energy will consider feedback it receives when preparing applications for any necessary local, state and federal permits or licenses required for the project, Parlow said. Great River Energy will also contact property owners once permits are received. The proposed transmission line would connect a new distribution substation, the Star Lake Substation, to the system. The substation will be built by Lake Region Electric Cooperative. Based on feedback from association members, the SLPOA Board hired an attorney to write an opinion based on the questions created by the survey. Click here to see the questions and responses. The SLPOA board would like to invite you to participate in a short survey in regards to the Shooting Star Casino Development. The SLPOA is conducting the survey to gather information and concerns of Star Lake property owners and other conerned citizens. It is important that you get an opportunity to voice your opinions on one of the largest developments Star Lake will see. So please take the time to complete this short survey. The survey closed on December 20, 2015. Thank you to those who took the time to provide feedback on this important issue. During the week of Sept 21-25, 2015, our Star Lake Property Owners’ Association (SLPOA) members and others living on Star Lake, were confronted with the news that a new Shooting Star Casino is proposed for land SE of the intersection of Co. Rd. 41 and 380th St., near the Spruce Lodge Resort area. We’ve included a report prepared by Lee Mindemann and the Star Lake Township Board summarizing some of the facts available of this issue. I urge all of our Star Lake lakeshore owners to read this Township Report, and the other links below to the subsequent stories coming out in local papers as well as the press release sent out by Shooting Star Casino in Mahnomen. Our SLPOA Board of Directors will be meeting Oct. 8 at the Dent Schools at 6:30 to discuss this breaking news and generate a plan of action as we go forward. My own personal reaction to this news was one of shock and great concern. I cannot fathom the idea of placing a large casino complex right next door to a quiet neighborhood of family lake cabins, a family-owned resort, and a church camp (Camp Joy). I have concerns about greatly increased traffic, lights, the behavior of the patrons to the facility, and potential adverse effects to the shoreline they own and the lake quality itself as a result of this. The population density of this complex could be substantial, with both a hotel and RV park in their plans. I have read no comments from Shooting Star about how they would mitigate any of these types of concerns that nearby neighbors or Star Lake owners would have. While these are my own concerns, I’m not aware yet how many of our SLPOA members, or others on the lake, would share these concerns. Please, as you all read and learn about this proposed project, email any Board members (names and contact information on the Contact Us page of this website) about your concerns and recommendations for action. Please, also, keep abreast on this website about a likely need for a fund raiser to our Lake Protection Plan to cover the legal and other potential costs of our response to this Casino proposal; joining the SLPOA at this time would also help generate funds. We can be a strong force by drawing together and voicing our concerns, especially to our County Commissioners. Thank you for your help in this troublesome situation! Write your Legislative and Congressional Members about this issue. Go to this Who Represents Me link and enter your address or click on the map. You can then click on each of the names listed and send your questions and comments. MAHNOMEN, Minn. (September 25, 2015) – Shooting Star Casino, Hotel and Entertainment, proudly owned and operated by White Earth Nation, has revealed plans to build a third casino located on Star Lake near Dent, Minnesota. Designed by Minneapolis-based Cuningham Group, construction will begin in 2016 and the projected opening is slated for 2017. The key resources needed to improve the White Earth Nation’s financial health and the scope of its decision-making and management responsibilities.